Falling for flavor! As the weather cools down, it’s time to warm up with cozy autumn dishes packed with spices and seasonal ingredients. 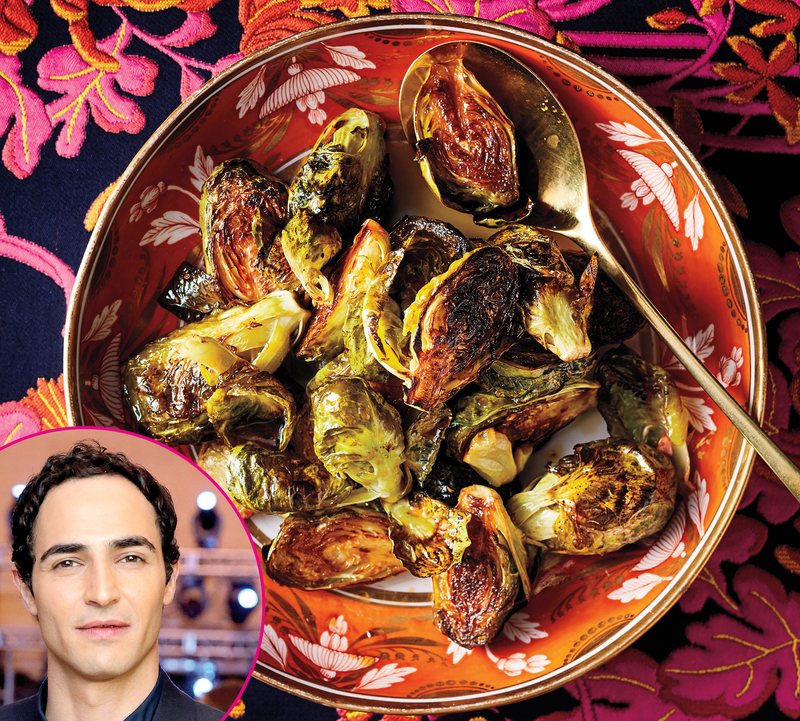 Us Weekly asked a handful of celebrities to share their favorite fall recipes. 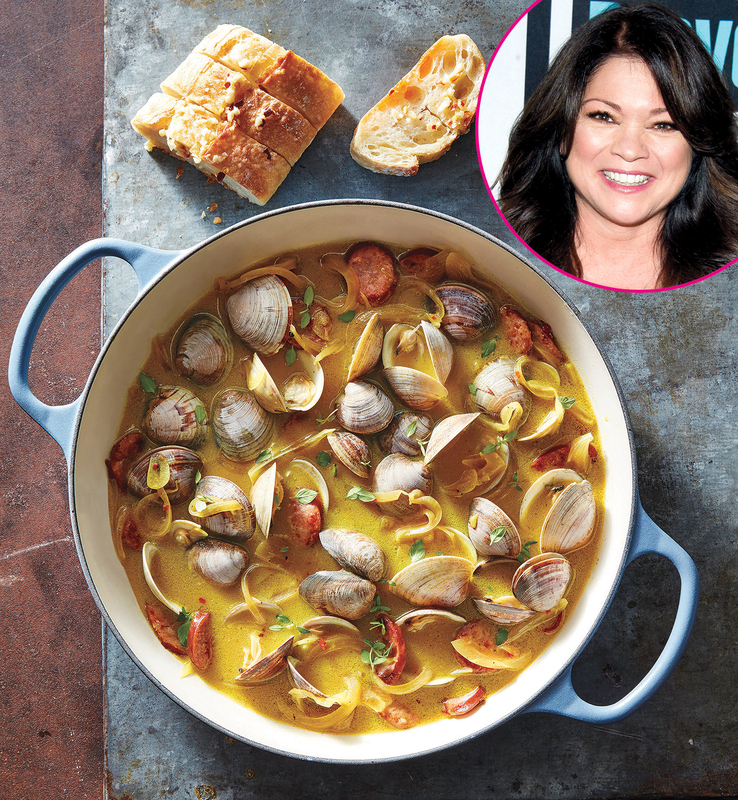 Read on for dishes from Valerie Bertinelli, Zac Posen, Jacques Pepin and husband-and-wife team Gabriele Corcos and Debi Mazar. Tell Us: What are you most excited to cook this fall? Heat the oil in a large skillet over medium heat. Add the sausage; cook, stirring often, until golden brown, about 5 minutes. Transfer the sausage to drain on paper towels, reserving the drippings in the skillet. Place the sausage in a large serving bowl. Add the shallot to the skillet; cook, stirring often, until translucent and tender, 3 to 4 minutes. Stir in the garlic and crushed red pepper; cook for 1 minute. Add the wine, stirring and scraping to loosen the browned bits from the bottom of the skillet. Stir in the coconut milk, butter, turmeric, ginger, salt and black pepper. Add the clams; cover the skillet, and let the mixture steam until the clams open, about 6 to 7 minutes. Transfer the clams to the bowl with the sausage. Stir the lime juice into the broth. Pour the broth over the clams and sausage. Remove the leaves from the thyme sprigs; discard the stems. Sprinkle the clam mixture with the lemon thyme leaves. Serve immediately with spicy garlic bread. Preheat the oven to 350 degrees. Cut the bread in half lengthwise through the top of the loaf, cutting to, but not through, the opposite side. Cut the bread crosswise at 1-inch intervals, cutting to, but not through, the opposite side. Combine the butter, garlic, crushed red pepper and salt. Spread the mixture over the bread and between slices. Preheat the oven to 375 degrees. Use a little of the olive oil to grease a rimmed sheet pan. Toss the sprouts with the remaining oil, 2 tbsp of the ponzu sauce, the garlic, and the salt in a large bowl. Turn the sprouts out onto the sheet pan (don’t wash the bowl), flipping them over so the cut side faces down. Roast the sprouts until they are browned, 12 to 15 minutes. Remove the pan from the oven and use tongs or a spatula to flip the sprouts over. Continue cooking until they are tender, 10 to 15 minutes longer. Return the brussels sprouts to the bowl, add the remaining 1 tbsp of ponzu sauce and toss to combine. Taste and season with more salt if needed. Transfer to a serving bowl if desired. In a small bowl, mix the first eight ingredients together to create a spice mix and set aside. 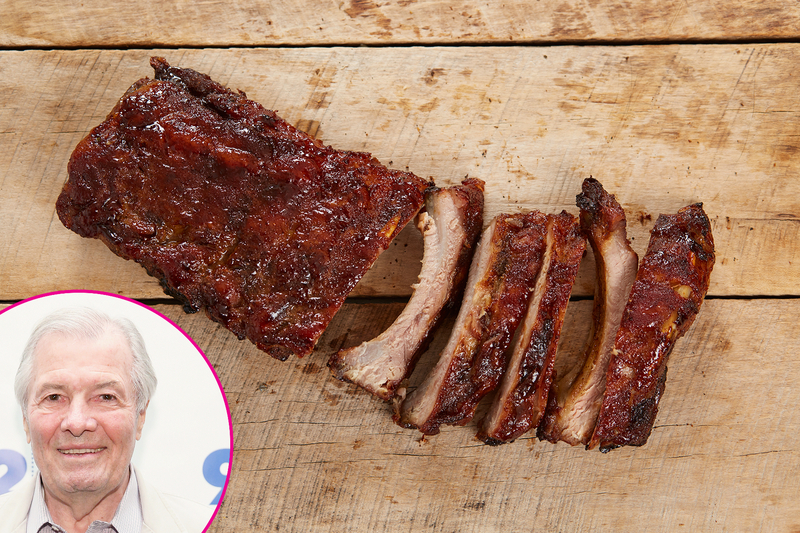 When ready to cook the ribs, pat them dry with paper towels. Rub them on both sides with the spice mixture and place them on a baking sheet lined with non-stick aluminum foil. Loosely cover the ribs with another piece of foil. Place in oven and cook for two hours. Uncover the ribs and cook another hour. Let rest and cool until lukewarm, then cut between the ribs to serve. Position a rack in the center of the oven and preheat the oven to 400 degrees. Lightly oil a half-sheet pan. Toss the butternut squash with the oil, rosemary and thyme on the prepared baking sheet. Season to taste with the salt and pepper. Bake, stirring occasionally, until the squash is roasted and tender, 20 to 30 minutes. Let cool. Bring a large pot of salted water to a boil over high heat. Stir in the farro and return to a boil. Adjust the heat to medium and boil until the farro is tender, about 20 minutes (or longer for whole-grain farro, up to 45 minutes). Drain and rinse under cold running water. Drain well. Let cool. Crumble the rosemary and thyme leaves off their stems onto the butternut squash and discard the stems. 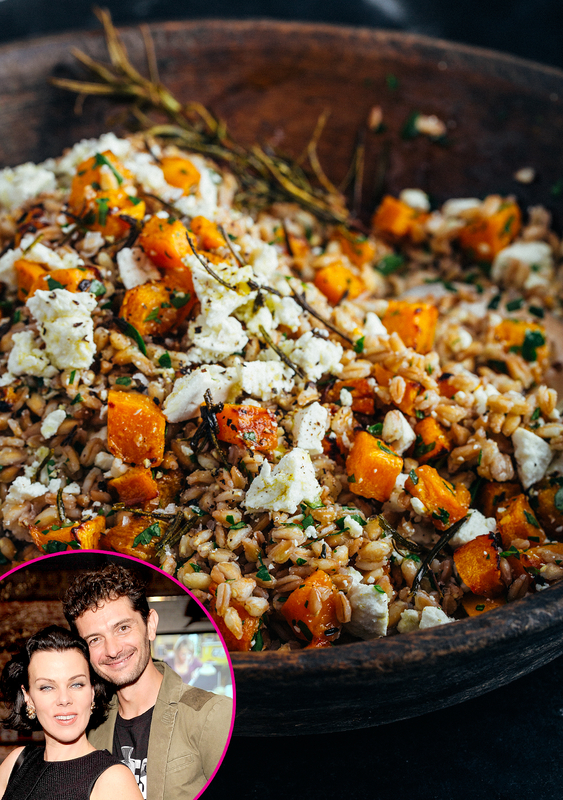 Mix the squash, farro and parsley in a medium bowl. Mix in all but 2 tbsp of the ricotta salata. Season to taste with the salt and pepper. Drizzle with olive oil, sprinkle with the reserved ricotta salata, and serve at room temperature.